Documentary Films 8mm Kodak film showing the Great Port of London. 8mm cine film footage of London Docks, explaining the history of the various merchant shipping. Cine film to digital transfer. All the 8mm cine film to digital footage was captured to our Apple computer via Black magic Design Hardware using the Pro Res 4.2.2 capture preset. Colour correcting documentary films from 8mm Kodak cine. 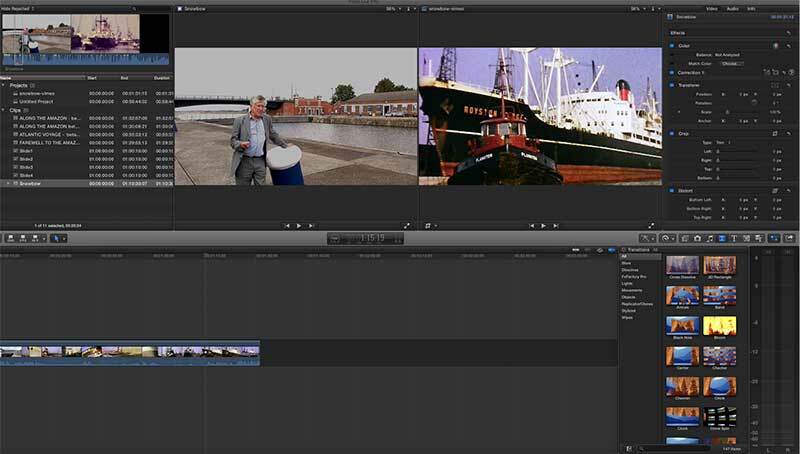 From there we colour corrected the 8mm Documentary films footage and using timecode provided by Des. The 8mm Kodak film clips where put into the correct sequence. The voice over was recorded in our studio using the on screen timecode display in Adobe Premier CC so that Des knew the correct timing. Once all the voice over sections had been recorded we then added them to the timeline in FCP X and trimmed where necessary. Des has over the years built up an impressive array of sound effects of all types of ships, Tugs and general dock side sounds. Laying the sounds and adjusting the volume levels to fit the scenes was a painstaking task but in the end they brought the old 8mm cine film to life. The last job to complete was to add credits and the final music track to the documentary films.